Dry eyes are usually caused by reduced tear production and/or incorrect tear fluid composition. Dry eye is often a chronic condition. People over age 50 have dramatically increased rates of dry eye, and post menopausal women are especially at risk due to hormone changes. Symptoms: In mild cases, a slight burning sensation is common and your eyes might feel dry or scratchy or you might have a sandy/gritty sensation. In moderate to advanced dry eye, you might experience blurred vision, sensitivity to light and even uncontrolled tearing. Treatment: Ocular lubricants such as Refresh Tears or Systane provide some relief from mild to moderate dry eye by replacing a deficient watery layer. 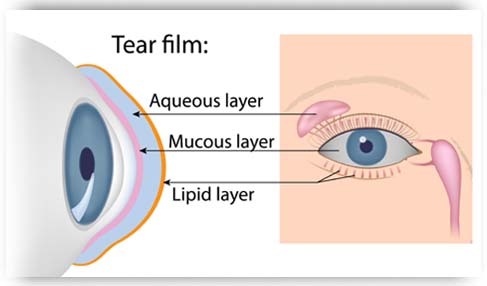 Other forms of artificial tears such as Soothe XP add more lipids to the tear film to help prevent tear evaporation. New research is beginning to stress the importance of Omega-3 fish oil (usually 3x/day as per formulation ~100-300mg EPA & 50-200mg DHA) or Flax Seed Oil (~1000mg of oil taken 3 times a day). These supplements reduce inflammation, but also cause the “oil” layer of the tear film to become thicker or healthier. Punctal Plugs are effective treatments only when the cause of the dry eye is not bacterial, allergies or strongly based on inflamatory issues. Punctal plugs actually make dry eye worse when there is other underlying causes instead of just poor tear production. Doctors are very careful when giving punctal plugs for this reason in particular.